The Spirit: The Origin Years, published by Kitchen Sink Press, 32 pages, cover price $2.95. In the early 90's, a company called Kitchen Sink Press published a ten-issue series called The-Spirit: The Origin Years. 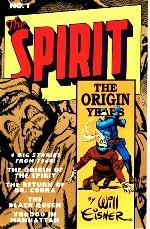 The series was comprised of reprints of nearly the first two years of Spirit strips, dated June 2 1940 to March 2 1941. For those not familiar with the work, The-Spirit was in reality Denny Colt, who, believed by the public to be dead, fights crime anonymously as a masked do-gooder. Sounds fairly typical, right? Well, while the first few weeks worth of adventures may have resembled the fare of most other strips and comics stories, creator Will Eisner was in no way satisfied with “typical.” His brainchild went on to be one of the most entertaining, beloved and lauded works in the history of comic strips OR comic books. Most striking was Eisner’s sense of design and storytelling. While there was no shortage of artists who could competently, even beautifully, render the human form, Eisner quickly began guiding his wonderfully-drawn characters with design techniques and use of panels that had never been seen before. He often used page design to set the pace of the reader’s progress through the story. This is no easy task when you consider that comics stories are largely at the mercy of the reader, who usually controls how slowly or quickly they progress, unlike movies and television, in which a director gets to determine the pace of the story. In this sense, Eisner’s mesmerizing work did what few others ever have, and he did it with interesting characters and engaging stories, neither of which ever felt stale or repeated. Included throughout all ten issues was a very entertaining and in-depth interview conducted by Tom Heintjes, in which Eisner shares much about the rigors and joys of producing the strip. The Spirit: The Origin Years is highly recommended. Find it at comics shops and online retailers and auctions. Prices vary, so shop around.